Active Learning Methodology Workshop is conducted Vivekananda Kendra Shiksha Prasar Vibhag in Vivekananda Kendra Vidyalaya Ramnagar, Silchar (16 to 18 February 2017) 31 Teachers (including 4 Principals) Participated from 5 Schools - VKV Ramnagar Silchar, Assam, VKV Borojalenga, Assam, VKV Badarpur, Assam, Subrai Vidya Mandir, Agartala, Tripura, Subrai Mission Convent School, Teliamara, Tripura] and Vivekananda Kendra Vidyalaya (NEEPCO) Umrangso (19 to 21 February 2017) 30 Teachers Participated from 5 Schools - VKV (NEEPCO) Umrangso, VKV Tumpreng, VV Jirikindeng, VKV Borojalenga, VKV Badarpur. Smt. Sivakami Sundari Retd. Chief Education Officer, Tamilnadu and Sri Anbazhagan N. State Coordinator for ICT (Information Communication Technology), Dept. of Education, Govt. of Tamildadu were the resourse persons. ALM is a Learner Centric Study where teachers can enrich the learning capacity of students and it gives a divergent exposure to learners. Different steps of ALM were shared like Introduction, self reading, group/ guided reading , finding difficult words and getting its meaning in small groups and then in larger group i.e. the whole class, Mind Map, Consolidation, Reinforcement, Evaluation etc. Subject wise different groups were made for different activities. 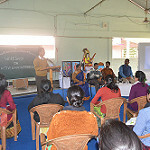 After initial training, teachers from each subject group took classes following ALM methodology initially among teachers and later for students in a normal class. At VKV Ramnagar, Silchar: Dr Bibhash Deb, Former Director of College Development Council, Assam University Silchar was the special invitee. He congratulated School Authority and VKSPV for conducting this kind of camp to uplift and sharpen the skill of teachers. At VKV (NEEPCO) Umrangso: Sri Kanti Ranjan ..., Principal JB Hagjer College, Umrangso attended the concluding session. He emphasized on implementing such methodology in classrooms will be bring a lot change in the learning process and educational scenario as a whole.